Finally continuing my Tamora Pierce reread. 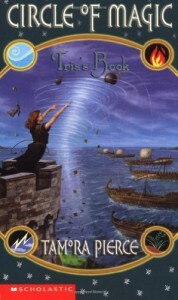 Of all the Circle of Magic books, this was the one I remembered the least, but it's still great. While all the books deal with the four children, each one does focus a bit more on a character and in this one it is Tris, the merchant girl who was abandoned by her family and has been struggling to gain control over her weather powers. The book picks up shortly after Sandry's Book with the cleanup from the earthquake. The four learn that when they bound their powers to fend off the earthquake, it was not temporary. I did remember this more as I went and I love seeing the bonds between the group. Hopefully I won't put off Daja's Book too long, as I remember that one the best of the four.